Jennifer Tessier, president of the Connecticut Chefs Association, samples a kelp and root vegetable salad made by Chef Ken Bergeron. Fueled by forkfuls of kelp and root vegetable salad, chefs brainstormed alongside current and prospective kelp growers about how to get more Connecticut sea vegetables into home and restaurant kitchens. Vellotti and seven other current and prospective growers – several of whom are hoping to plant at sites in Long Island Sound this November – met with eight chefs at the UConn Avery Point campus Sept. 24. The workshop was organized by Anoushka Concepcion, aquaculture extension educator with Connecticut Sea Grant, to help foster growth of the state’s fledgling seaweed aquaculture industry by identifying challenges to processing and marketing and ways to overcome them. 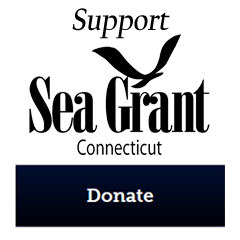 During an overview of the industry, Concepcion said there are now eight permitted kelp growing sites in Connecticut waters of the Sound, with several permits for additional farms pending. A native winter crop, kelp is planted using seed string wrapped onto arrays of anchored lines in late fall, then harvested in May and June. A second edible species native to the Sound, Gracilaria, has not yet been approved by state regulators for open-water planting and harvest, but is being grown on a limited scale in indoor tanks, she said. Maple-glazed kelp, carrots, onions and rutabagas was served during the workshop. 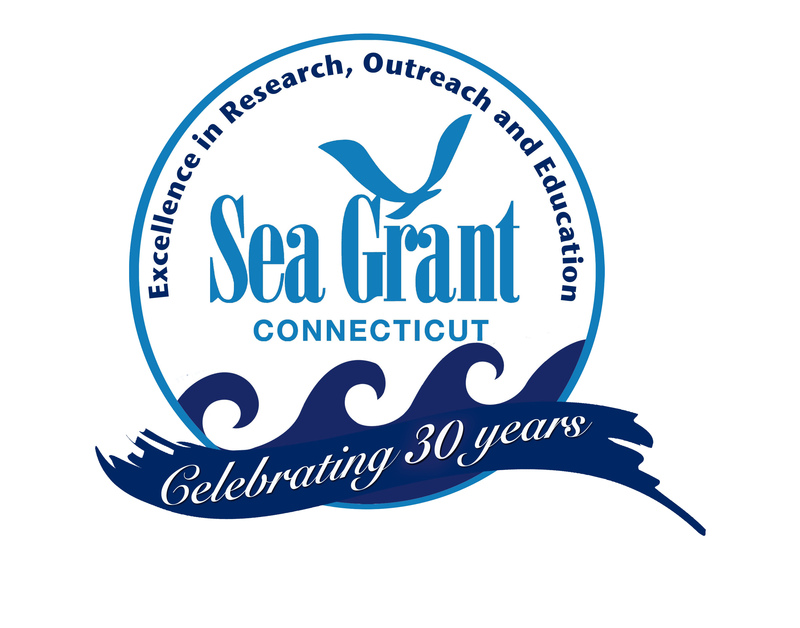 Concepcion also shared results of a seafood survey commissioned last year by Connecticut Sea Grant that included several questions about seaweed. About 35 percent of the 1,756 state residents surveyed said they ate seaweed, the majority of them women who also said they would be interested in new seaweed products. Other survey data seemed to indicate that millennials – those ages 22 to 37 – are most inclined to consume seaweed, but virtually all of the seaweed available in Connecticut grocery stores and restaurants is grown elsewhere. 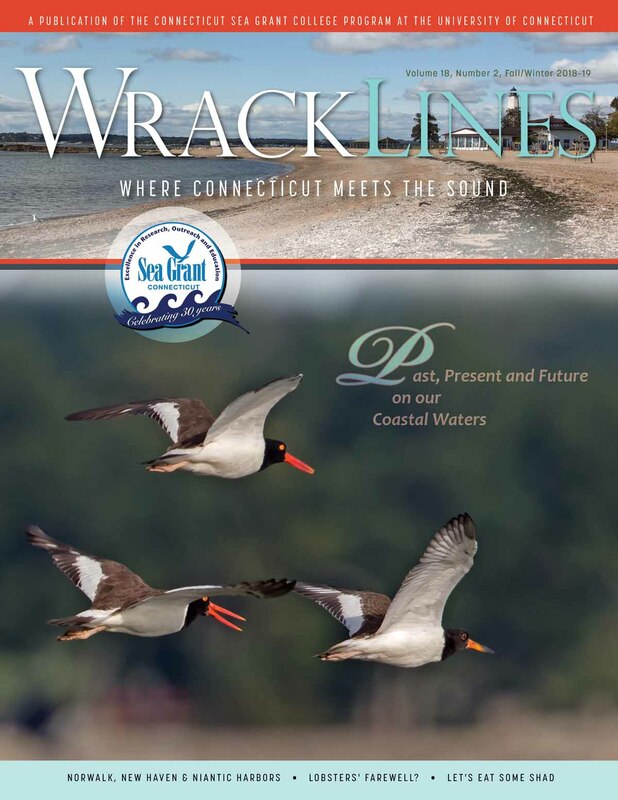 The current strong interest in locally grown foods presents an opportunity for Connecticut grown seaweed sales to advance. Several chefs also noted that kelp — which is high in Omega-3 fatty acids — would help satisfy the growing appetite for nutritious, vegetarian and vegan fare and novel cuisine, especially among young adults. “There’s your potential market,” said Concepcion. 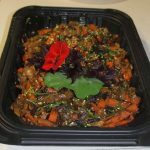 Ken Bergeron, a chef and author of vegetarian and vegan cookbooks, brought a dish made of chopped kelp sautéed with carrots, onions and rutabaga and mixed with a maple-soy-sesame sauce. As fellow chefs complemented the savory blend of flavors in the dish, Bergeron said he obtained the kelp they were eating from a grower in Maine. “I’d love to be using Connecticut grown product,” he said. Chefs received sample packages of frozen kelp from grower J.P. Vellotti. Vellotti, now in his fourth year of growing kelp, said challenges include the short shelf life of freshly harvest crop. Developing a processing infrastructure for blanching, freezing and packaging the kelp appears to hold the greatest promise for moving the industry forward, he and others agreed. Jenna Nicol of the state Department of Consumer Protection’s Food and Standards Division encouraged growers to use her agency’s online databases to connect with food processors in the state. 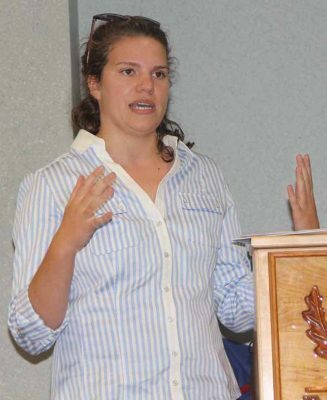 Nicol, the manufactured food regulatory program standards coordinator for the department, also encouraged growers to attend the Connecticut Food Expo in May 2019 to network with others interested in new products, and offered to help introduce growers to business owners who could help them with processing and marketing. “I’m happy to help facilitate that conversation,” she said, adding that proximity to the New York and Boston food markets is a big advantage for Connecticut food businesses. Jill Pegnataro, farm manager and hatchery technician for Green Wave, a Branford-based nonprofit that offers training to those interested in growing kelp, said kelp is an environmentally beneficial crop, removing excess nutrients from the water without inputs of fresh water or fertilizers, and “could help solve the food crisis in the future.” Green Wave has trained 25 prospective kelp farmers from Connecticut as well as Rhode Island, New York and Massachusetts. “This is a really exciting time for kelp farming,” she said. 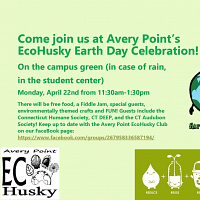 Jill Pegnataro, farm manager and hatchery technician for Green Wave, talks about the non-profit organization’s farmer training program. “We’re on the cutting edge, and you’re going to see Connecticut become a very strong kelp state,” he said. Connecticut-grown kelp, he said, is harvested when the long wide ribbons are three to eight feet long – optimal for culinary use. Larger kelp harvested being in Maine is more suited to industrial uses such as fertilizer, he said. He added, however, that he doesn’t expect kelp to become a “center of the plate” vegetable, but one that would be used along with other vegetables in stews, soups and salads. 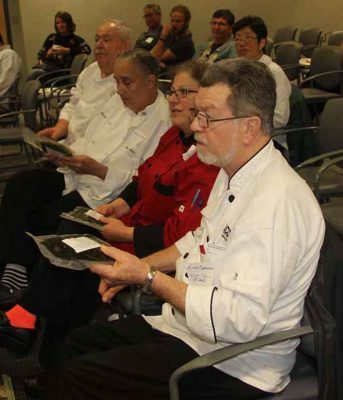 Chefs expressed enthusiasm about incorporating kelp into different dishes and teaching students about it. 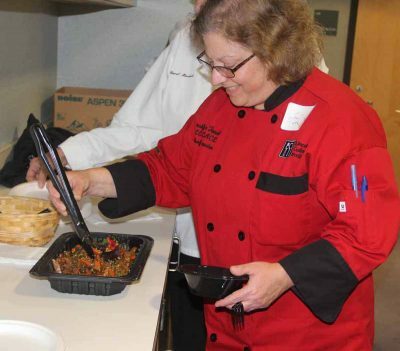 “Going right to the next generation is what you need to do,” said Jennifer Tessier, president of the Connecticut Chefs Association and a food educator. While the meeting did not generate a specific action plan, it was an effective forum for generating ideas, sharing information and zeroing in on the main problems that need to be overcome for kelp to reach its potential as a viable food crop. “The biggest thing is the packaging and the storage and the consistency,” said James Oswald, first vice president of the Connecticut Chefs Association. The two key missing pieces, Concepcion said, are commercial processors and storage facilities. Several participants suggested that once that is solved, a grower cooperative could be formed. Robert Granfield, right, describes his experiences growing kelp at a site in Milford to Connecticut chefs. 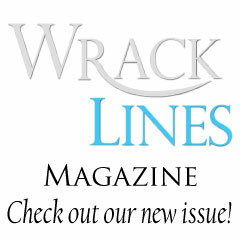 Chef Ken Bergeron’s recipe for maple-glazed kelp, carrots, onions and rutabagas was included in the online version of the Spring-Summer 2018 issue of Wrack Lines magazine. 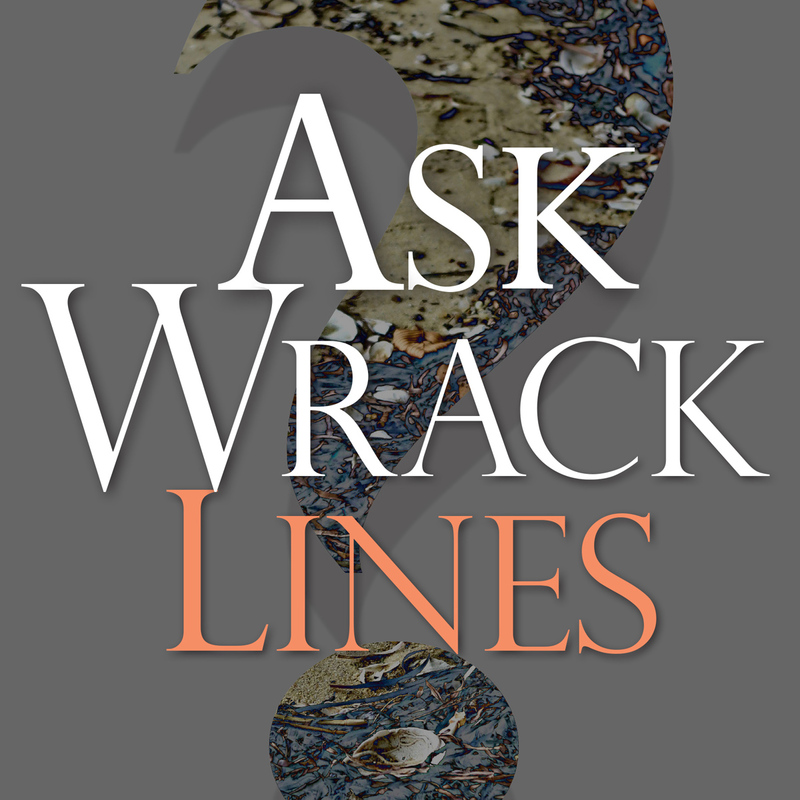 His recipe, along with a collection of other recipes for kelp and Connecticut seafood, can be found here. This entry was posted in News and tagged 2018, Aquaculture, kelp, Long Island Sound, Sea Grant, Seaweed.